uKnowKids recently released a few cyberbullying statistics which were displayed through an infographic titled "The Truth About Cyberbullying". Our intention was to provide parents with some information and statistics from last year related to the growing issue of cyberbullying. Thanks to Nancy Willard and a SAMHSA (The Substance Abuse and Mental Health Services Administration) taskforce we have noticed that one of the statistics was miscatorgized and thus misrepresented a very important statistic. 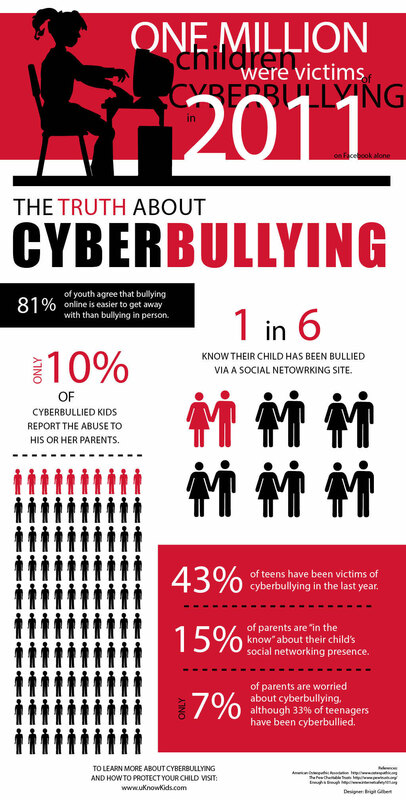 The original inforgraphic claimed that 97% of middle school aged teenagers have been cyberbullied. The intended statistic should have shown that 97% of teens have access to the internet and according to the NCPC "Stop Cyberbullying Before It Starts" 43% of teens have experienced some sort of cyberbullying behavior online. We would like to thank Nancy, and her taskforce for helping us locate our error as well as their continued work on developing strategies to address the incorrect and damaging information that is being distributed on bullying and cyberbullying. We apologize to all that were misinformed, it is our goal to provide our customers, readers and fans both accurate and dependable information on the latest hot topics and safety trends online. We thank you for your continued dedication to keeping kids safe!